The Stockings of Cambridge (SOC) and One-Touch Stockings of Cambridge (OTS) tasks both assess the processes involved in spatial planning, but which is more appropriate for different participant groups? It all depends on the absence or presence of cognitive or motor impairments. What are the CANTAB Stockings tasks? The CANTAB Stockings tasks have taken the traditional Tower of London (Krikorian, Bartok, & Gay, 1994; Shallice, 1982) assessment of spatial planning and working memory into the digital age. The Stockings of Cambridge (SOC) and One-Touch Stockings of Cambridge (OTS) tasks look, on the face of it, like the same touch-screen assessment: participants are asked to work out how to make the two sets of stockings look the same. The key difference between the tasks is that whilst SOC requires participants to manually move the balls into position, one-by-one; OTS asks participants to mentally calculate, up-front, how many moves are required. The mental manipulation required for OTS is computationally more challenging, but less demanding from a motor perspective. Consequently, studies into working memory and planning for typically developing adults or adults who struggle with motor impairments, are more likely to use OTS. In contrast, groups who may struggle with the increased working memory demands of OTS, such as children and older adults with cognitive impairments, may choose to assess planning with SOC. Figure 1 visualises the distinction. Of course, the study decision should be made on an individual basis. Figure 1. 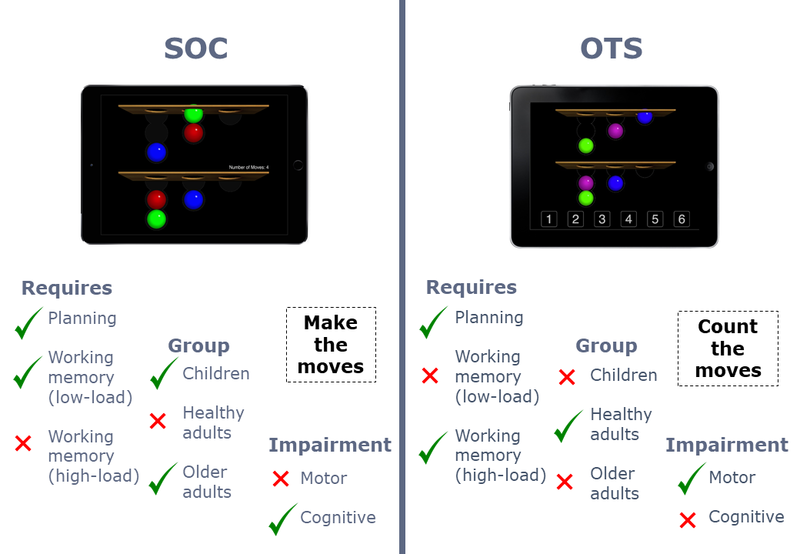 The distinction between the SOC and OTS tasks. Please note that the above are generalised recommendations. Researchers are advised to talk to our product specialists for case-by-case guidance on the most appropriate tests to use for a study. Here we will discuss some key examples of SOC and OTS in use with these participant groups. The SOC task was used to assess the effects of galantamine, an FDA-approved treatment for the symptoms of mild-to-moderate Alzheimer’s disease (Alzheimer’s Association, 2017), on working memory deficits in mild cognitive impairment (MCI) (Koontz & Baskys, 2005). Of the 19 patients with MCI who were included in this double-blind placebo-controlled study, eight were administered galantamine, and 11 were assigned to the placebo group (Koontz & Baskys, 2005). The study was conducted over 16 weeks, with visits every four weeks. The dose of galantamine was gradually increased across the visits, and cognitive testing was repeated (Koontz & Baskys, 2005). At visit four, the galantamine group were performing significantly better than placebo on the SOC task: in terms of the number of problems solved in the minimum number of moves (Koontz & Baskys, 2005). The researchers postulated that this delayed improvement in function could be attributed to prolonged exposure to the drug, however this is a speculative assumption (Koontz & Baskys, 2005). SOC was used to assess spatial planning in children aged 8-15 years old, 89 of which had foetal alcohol spectrum disorders (FASD), and 92 of which were typically developing (Green et al., 2009). The children with FASD showed significant deficits on the SOC task by struggling to solve problems in the minimum number of moves, and not spending sufficient time planning a problem-solving strategy. The difference between the groups (FASD vs. TD) was most pronounced as the difficulty level of the task increased (Green et al., 2009). The OTS task was included in a comparative assessment of orbitomedial prefrontal cortex function for 18 participants with amyotrophic lateral sclerosis (ALS), a motor neuron disease, and 18 typically-developing controls (Meier, Charleston, & Tippett, 2010). The study found that the ALS group needed more attempts to come to the correct solution (Meier et al., 2010). Nevertheless, more time was required by both groups to solve the harder problems. In 2013, Müller and colleagues measured the effects of modafinil, a cognitive enhancer, on the OTS task performance of typically-developing adults. The study employed a double-blind, placebo-controlled parallel design with 32 participants receiving modafinil (200 mg) and 32 in the placebo group (Müller et al., 2013). The study found that performance was enhanced for the modafinil group, compared to the placebo group, when the task was more demanding (later trials). This difficulty-driven effect speaks to why it’s important to employ tasks that are appropriate for each group’s ability level: avoiding floor and ceiling effects. When to use SOC or OTS? In conclusion, SOC and OTS measure similar constructs, so task selection is predicated on the selective sparing and impairments (cognitive vs. motor) of the participant groups being tested. Want to find out whether to use SOC or OTS for your study?